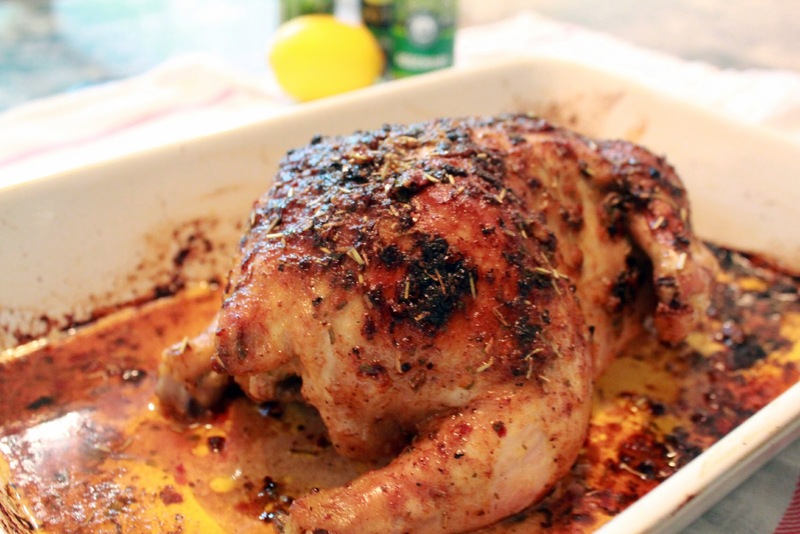 I’m going to let you in on a secret….I’ve never eaten a roasted chicken before!! Ssshh, don’t tell anyone now! Yes, I agree with you, I haven’t lived have I. Well, all that changed last night when I bought a beautiful bird who was calling out my name….”Sukaina, pleeease come cook me and eat me up……now” One of the reasons I haven’t ever attempted to make this meal myself has been because I had always been averse to eating chicken with skin on it. Also, something about looking at a whole chicken with rubbery, speckled skin that put me off. And when I recently read a recipe that talked about ”stuffing the chicken’s bum”, that just conjured up gross images in my head. But then, Nando’s made an entry into my life and well….I’ve never looked back since. Trust me when I say, handling a skinned whole chicken is well worth this meal. Since this was a new dish for me to tackle, I spent hours looking at recipes online. You’d have never known there are about a million different ways to cook a roast chicken, different herbs to marinate with and different cooking times. My recipe is one which doesn’t take long to prepare (all of 5 minutes actually) so it’s great weeknight meal. It uses herbs that I’m willing to bet are sitting in your pantry right now. The chicken itself was nicely browned on the outside and super juicy on the inside. The trick for a succulent chicken I feel is to keep basting the chicken with its juices every 20 minutes or so. All I can say I’m a convert now for sure. This one is definitely a keeper. 1) Pat the chicken completely dry. This helps the marinade adhere to the chicken better. 2) When placing the chicken on your tray, tuck the wings underneath the chicken. Wings cook the fastest so doing this ensures even cooking. 3) Basting every 20 minutes or so keeps the chicken moist and helps with caramelizing the skin. 4) If you feel you chicken is becoming too brown on the outside but still isn’t cooked on the inside, then cover the tray with foil and continue cooking. 5) Let the chicken rest for 10 to 15 minutes once you remove it from the oven as this helps to redistribute the juices within the chicken, making it more succulent. If you have any more tips that I’ve missed, don’t forget to tell me in the comments section. Pre-heat the oven to 375 degrees Fahrenheit. Wash the chicken well, taking care to wash the inside of the cavity and removing any giblets (whole chickens are delicate so handle gently). Pat the chicken till it’s completely dry. Make the marinade by mixing together butter, garlic paste, mustard, salt, all the dried herbs (I’m sure fresh will taste far superior but I didn’t have any on hand), lemon juice, Italian seasoning and chili flakes. Rub this marinade all over the chicken including under any flaps of skin that lift up and the inside of the cavity. Stuff cavity with the lemon and garlic gloves. Arrange into an oven proof dish and place into the middle rack in the oven. Cook until chicken is done, basting with the released juices every 20 minutes or so (Mine took 1 hour and 20 minutes). Remove from the oven and let it rest for at least 10 minutes before digging in. We served this with roasted potatoes and a green salad drowning in balsmic vinegar. Okay, so this name may have thrown y’all off a little. I’ve rigged this entree a tad. Only a tad though :). This is one of my husband’s favorite weeknight meals. He LOVES alfredo sauce – and when we need a break from meat/poultry, we turn to good ol’ Salmon. So this entree is a concoction of the two merged together. However, given our crazy schedules, I don’t really have the time to whip up a home-made white sauce – so I thank God for ready made Alfredo Sauce that tastes DIVINE! Classico is a true life-saver! The best part of this meal, is the quick clean-up. I usually use a bag like foil to grill the fish, boil the pasta in the same pot that I’m going to warm up the sauce in! So essentially, just one pot, one spatula and a colander to clean up! Hope y’all enjoy as much as the husband does! 1. Wash the salmon fillets, rinse with vinegar to eliminate any pungent odors. 2. Take a bowl and mix together all the marinade ingredients: lemon pepper, garlic powder, onion powder, steak seasoning, paprika, crushed red chilly flakes, soy sauce, Worcestershire sauce and chilly infused oil. Submerge the fillets into this marinade and refrigerate for 2 hours (at minimum). Turn the fillets half-way to ensure they are coated equally. 3. Preheat oven to 425 degrees (Farenheit). Take a long peace of foil, and make a bag like structure to insert the fillets in. Ensure all sides are closed, except a small hole to allow steam out. Place on baking sheet, and let bake for 15 minutes. 4. In the meantime, prepare your white sauce. In a pot, heat up the extra virgin olive oil. 5. Add parsley flakes, oregano, basil, garlic granules, black pepper, salt. Stir, but don’t allow garlic granules to burn. 6. Quickly add in the jar of Alfredo sauce – reduce heat and let simmer. 7. If the consistency is too thick, you can add 1 tbsp water, but not more. 8. Add cooked angel hair, toss to coat. Ensure it warms up thoroughly before you serve. 9. Serve with grilled salmon. We’ve had a makeover!! Leah from Cutesie Blog Designs has given us a brand spanking new look and I think the site definitely looks fab. Leah really had her work cut out as me and Sabrina are both quite picky but after countless emails…here we are! Now back to the real business of food. I have a confession to make. I love love love cumin….even more than chocolate (ok kidding!!) but you get the idea. Cumin is one of my favourite spices and what I love best about it is the earthy aroma and taste it gives any meal. For me, this is best represented in cumin scented chicken curry as it’s obviously the star ingredient. So if you’re a fan of cumin, read on. This curry is quite soupy and light unlike many Indian curries and doesn’t require many ingredients. This dish is also full of coriander, another favourite of mine. If it was up to me I’d add coriander to almost anything. There are several versions of this recipe. Some, especially those found in restaurants, have tomatoes as the base. But I quite like the lightness of this recipe sans tomatoes as it makes it slightly different from the normal curry. We love eating this with steamed basmati rice. Add oil to a pan and add onions, cumin seeds and salt when hot. On medium heat, fry the onions until they are translucent and just begin to change color. Add slit green chillies and 2 tbs of the chopped coriander. Follow this by adding ginger and garlic paste and fry for 30 seconds or so. Add cumin, coriander and turmeric powder and fry for a minute. You can now add the chicken and stir fry until the chicken has sealed and is a white color. Add water so that all the chicken is fully immersed in the water and partially cover with a lid. Let the chicken simmer on low to medium heat until the chicken is cooked. You can add more water whilst the chicken is cooking if you feel it’s drying out. Turn off the heat, garnish with the remaining coriander and serve with steamed basmati rice. So you may think the first post is a little boring but it is a meal that is eaten once a week in our household and is Akber’s favourite curry. I guess we are complete carnivores and usually need some form of meat or chicken on our table. This recipe is a mishmash of my mom’s regular meat curry and my grandfather’s. 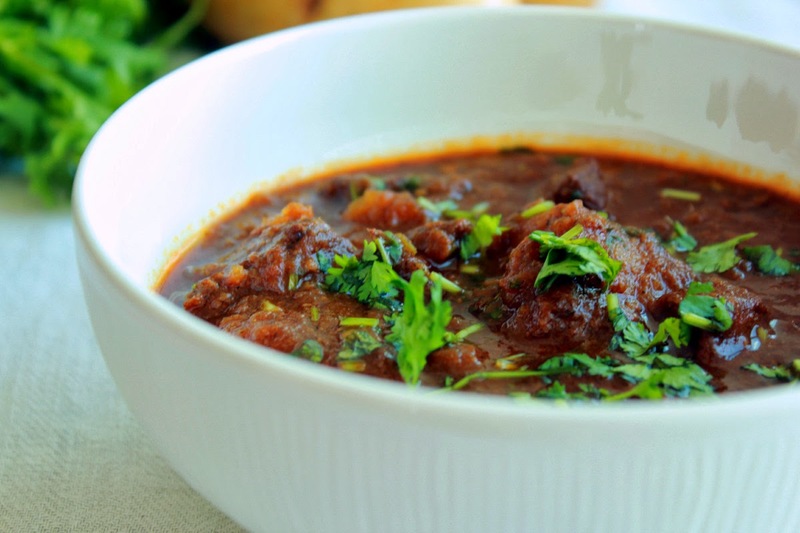 The curry has a smooth texture with lamb that melts in your mouth and since it is pressure cooked, the steam really allows the spices to infuse into the lamb, making it fragrant and rich. 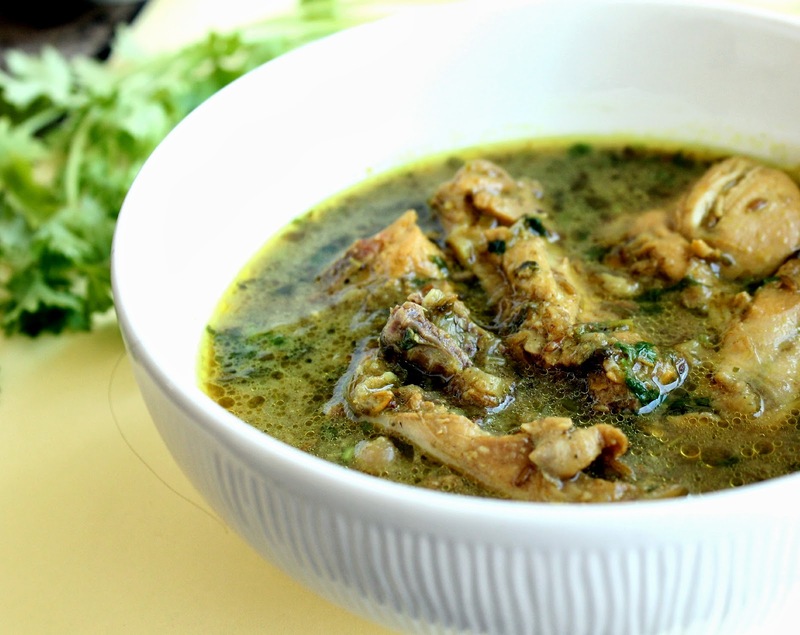 I usually serve this with steamed rice or chapatis (when I’m on a diet!) but traditionally it is also served with thick crusty slices of white bread. Add oil to a pressure cooker and when hot, fry onions with salt on medium heat until golden brown. Add grated tomatoes, ginger and garlic and fry until you see a film of oil on top. Add the coriander and cumin powder, turmeric, red chili powder and tomato paste (I omit the red chili powder as my 18 month old eats the same food as us). Fry for a further 2 minutes. You can add a little water at this stage (approx 3-4 tbsp) if you feel you curry is sticking to the bottom of the pressure cooker. Add your meat cubes and enough water so that the meat is submerged completely in the water. Pressure cook until the lamb is cooked and soft (mine usually takes about 30-45 minutes as the meat in Dubai is quite tough). You can then add the potatoes and simmer the curry on low heat until the potatoes are cooked through and soft. Turn the heat off and add garam masala and coriander. Serve hot with steamed basmati rice or chapatis.